Your website design made easy. 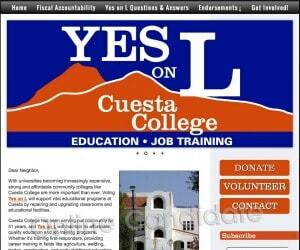 We provide everything you need to create, launch and manage your political website. Fast and affordable: Order, create your site login, and get started immediately. Custom designs are completed in just a few business days. 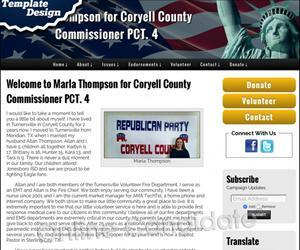 Easy to use: Our content management system allows for easy website updates. Built-in tools are included. Easy for inexperienced users, but flexible enough for “techies”. Integrate with other services: Tie in any social network, fundraising or email system. Additional web marketing services: Site Launch package, Social Media Setup, Mailchimp setup and more. Exclusive campaign resources: Clients have access to exclusive online marketing resources and tools, including OnlineCandidateResources.com. Up-front pricing and NO hidden costs. Order now and start your website in minutes. With our built-in tools and design options, you won’t need to hire expensive web designers or programmers. Our Regular Website Package and our Enhanced Website Package include professional design customization. These packages feature extended hosting and a custom look. Need a logo designed? We’ll create that for you, too. 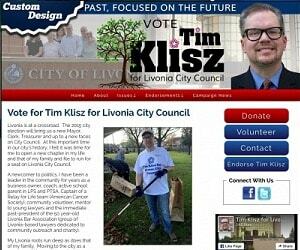 For the Regular Website Package, we design a website header with your campaign colors, logo, background and candidate head shot. 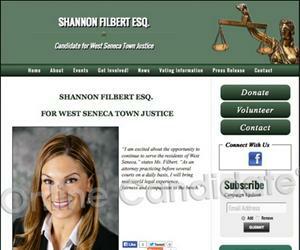 We customize the site colors, font and backgrounds for a professional look suitable for any political campaign. Don’t have a logo? No problem. We’ll create one for you that you can also use for print. You have full control over your content and tools. The Enhanced Website Package features design customization, but also includes the setup of your initial site content. Don’t have a logo? No problem. We’ll create one for you that you can also use for print. We’ll arrange your site text and images and optimize your content for search engines. After that, it’s all in your control. 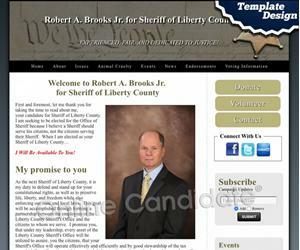 Our Lite Website Package and Monthly Option include template-based designs. Choose your own header graphic, text, fonts and color schemes. You can upload your own header graphic, if you choose, or upgrade to a custom design. 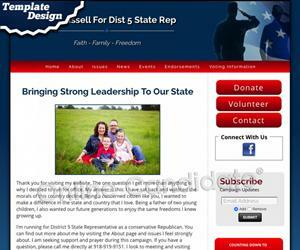 Our built-in political template system is flexible and responsive so you can easily change the appearance and look of your site. Header graphics are included for you to use. 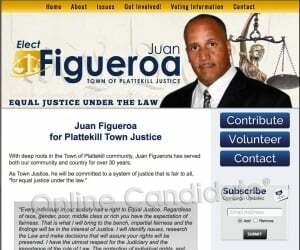 Our Lite Campaign Website Package is designed for campaigns starting with a tight budget or with a limited time-frame. 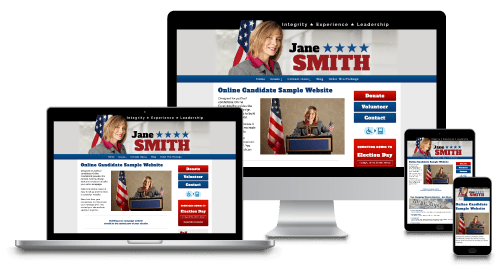 With our campaign website templates, you can choose from a wide selection of header images, colors, and fonts to create a unique look that works for any campaign. Then add your site content and go live! Want a custom look? Upload your own header image or order a Custom Design Add-on. Many of the color schemes have corresponding brochure print templates that you can use for your offline marketing. 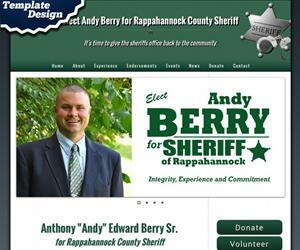 Our Monthly Website Option is geared for political campaigns that do not want to go with one of our campaign website packages. Choose from a wide selection of header images, color styles, and font types to create a unique look. Then add your content and goes live. The Monthly Option includes recurring billing that can be cancelled at any time. Many of our template color schemes have corresponding brochure print templates that you can use for your offline marketing. 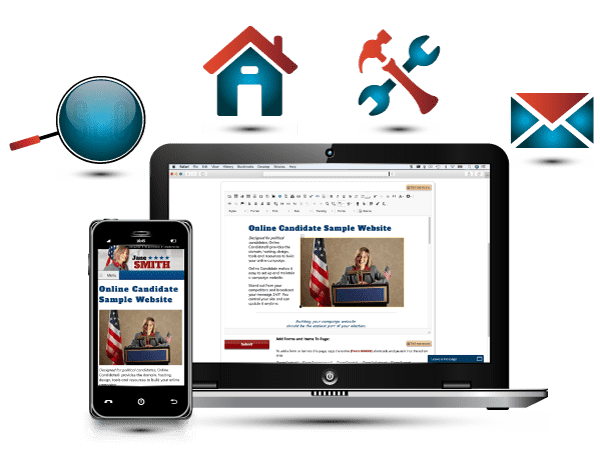 Price: $29/month – Includes the Online Candidate platform and site tools, free domain registration and month-to-month hosting. 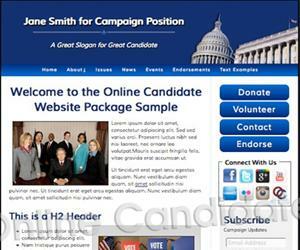 See why local, statewide an congressional campaigns just like yours use Online Candidate every election cycle. Get your web design, hosting and ability to control your site all in one package. Your site comes pre-populated with standard pages to help you get started fast. Look your best with a fantastic custom design or professionally-designed web templates. Responsive design means your site looks great on desktops, tablets and mobile devices. Need a campaign logo? We'll create one for you with our custom design - plus we'll give you a high-res version to use in your print materials for FREE. Fully integrate with Raise the Money and PayPal - or use any donation service you want. Best of all, we don't charge extra or act as a middleman with your fundraising. Connect and engage voters by linking your Facebook, Twitter and social media accounts. Visitors can share your content with others, helping to spread the word. Recruit others with a configurable volunteer form. 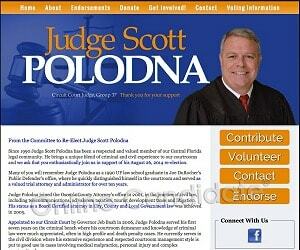 The built-in endorsement form lets you collect testimonials for use in your campaign. Get a FREE .com domain name of your choice. Political domains like .republican and .democrat available. FREE SSL certificate included for security. Easily edit pages with built-in layout styles. Embed images, slideshows, videos, audio files, maps and presentations. No HTML skills needed - and no need to pay for a developer for updates. 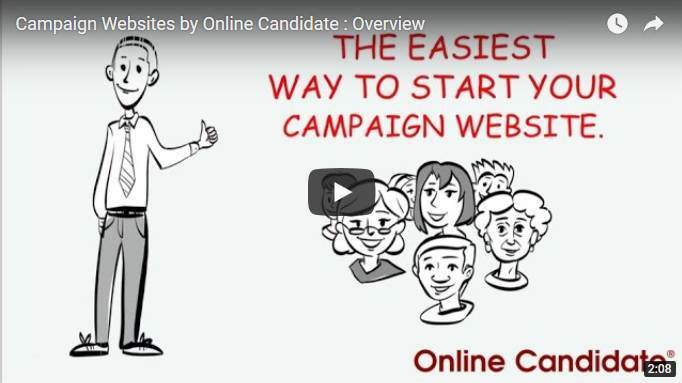 Create your own campaign email accounts and unlimited email forwards. Easily integrate with a CRM or email marketing services like Mailchimp and Aweber. Built-in blog, events list, countdown widget, customizable forms, image sliders, form data capture, landing page generator and more. Free candidate resources including training modules, tools and downloads at Online Candidate Resources. 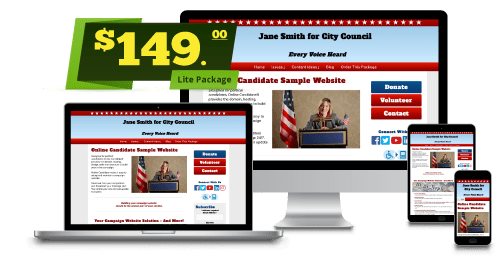 Besides political websites, we offer digital campaign products and marketing services for candidates running for city, county, state or federal office. Have questions about starting? Call Carol at 866-460-0995. You have enough to do getting your campaign off the ground. 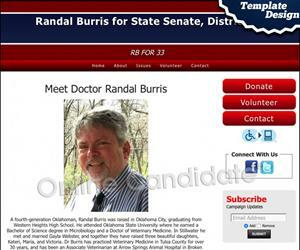 Why let the creation and design of your election website become a headache? We've streamlined our setup process down to a few simple steps. We have great options for any budget. Choose your domain name and order online or over the phone. Create your user account and start building your site. For Regular and Enhanced Packages, we will get to work on your site design. Once you are ready to launch, go live. You have full content control and access to all platform features and resources. Grow with your campaign. With our Lite Package and Monthly Option, you can upgrade for a custom design and look. We also provide addon options for Initial Content Setup, Social Media Setup and our Website Launch Package. Options can be ordered when you start or at a later time. You are not alone. We've worked to make our system easy to use. Your site administration contains step-by-step instructions for managing your site. If you are stuck, submit a trouble ticket and we'll respond quickly. If you have an emergency or important question, give us a call. Our customer interaction and attention to detail sets us apart from other services. We offer additional services to build your online presence – fast. Let us set up your initial website content for you. We’ll arrange your text and images for a pleasing design. After that, it’s all in your control. Content Setup is performed ONCE with the materials provided. Add as a Website Option when you order. Note: Content Setup is included with the Enhanced Website Package. 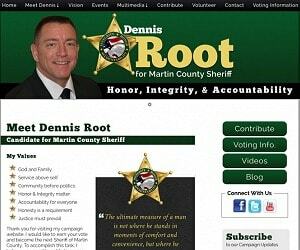 Your website can be upgraded to a custom design with header that includes your logo, colors and head shot. This can be ordered at any time for a one-time price. Note: Custom design is included with the Regular and Enhanced Website Package. We can help your campaign get that initial promotional boost to rank well in the search engines and/or set up your campaign Facebook and Twitter accounts. This can be added as a Website Option or ordered when you are ready to launch. Save time and get your email campaign started the right way. Let us set up and configure your Mailchimp account so you can concentrate on your campaign. This can be added when you first order or at a later time.